Citation: C N Trueman "The Battle of Kursk"
The Battle of Kursk took place in July 1943. Kursk was to be the biggest tank battle of World War Two and the battle resulted in a severe crisis for Nazi Germany’s war machine in Russia. Operation Barbarossa had shown the power of armoured warfare when Hitler unleashed Blitzkrieg on the Red Army. Together with aerial support, the Wehrmacht’s tanks had torn swathes through the masses of the Russia Army. The Russian (Red) Army had little in reserve and the Germans nearly made it to Moscow before the infamous Russian winter set in at the end of 1941. However, after the defeat at Stalingrad, the German army on the Eastern Front had been in retreat. If this retreat west continued, it would prove to Germany’s enemies that the nation’s military power had been fatally wounded at Stalingrad. A continued retreat would also encourage the work of the Russian partisans massed in the west of their country – waiting to strike on a retreating army. Therefore, for the morale of the German Army, the German High Command had to organise a massive offensive against Russia – if only to prove that the German Armed Forces based in Russia were still mighty and a force to be reckoned with. A successful German offensive had obvious military consequences for the Germans. However, they also hoped to force through a political one. It was known that the Russians were becoming increasingly tired at the seeming unwillingness of Britain and America to open up a second front in the west. A defeat of Russia in the east might result in the collapse of any form of relationship between the Russians and the Allies in the west. This could only be to the advantage of the Germans. By the summer of 1943, the Wehrmacht and Luftwaffe were increasingly well armed. The German industrial sector headed by Albert Speer, was expanding at a massive rate despite the bombing of Germany by the Allies. In 1942, Germany produced 5,700 medium and heavy tanks. In 1943, this had increased to 11,900. The production of planes had doubled between the two years; ammunition production had increased three-fold by 1943. By the summer of 1943, the Wehrmacht was also being equipped with new weaponry. The Tiger, King Tiger and Panther tanks were introduced as was the new Ferdinand self-propelled gun. The Luftwaffe received the Focke-Wolfe 190A fighter and the Henschel 129. The new equipment was matched by an increase in manpower. As there was no second front in the west – and the Germans predicted that there would not be in 1943 – men based in the west were moved to the Russian Front. By the summer of 1943, two-thirds of the German Army was based in Russia. By the summer of 1943, the Russians had steadily advanced east. However, a bulge had occurred south of Orel and north of Kharkov. At the centre of this bulge was Kursk. It was here, and to eradicate this bulge in preparation for a push east, that the Germans centred their attack in what was called ‘Operation Citadel’. If this bulge was not taken out, then there was every chance that the Russians would use the troops they had stationed there to launch an attack on the Germans at Orel and Kharkov – but attacking behind them, thus trapping the Germans between two Russian forces. For the attack on Kursk, Germany had grouped 900,000 soldiers in the region, 10,000 artillery guns, 2,700 tanks and 2,000 aircraft. About 1/3rd of all Germany’s military strength was concentrated in the area. Elite Luftwaffe units were ordered there. Hitler ordered that “there must be no failure”. Reconnaissance planes photographed all the defensive systems that the Russians had built. “No offensive was ever prepared as carefully as this one.” General Mellenthin. However, Russia’s military leaders had not been sitting idly by. Their intelligence had alerted them to a massive German offensive; they knew where it would be, the numbers involved and near enough when it would start. They decided on a defensive strategy to allow the Germans to wear themselves out. The defence of Kursk was put into the hands of two generals – Rokossovsky and Vatutin. In preparation for a massive counter-offensive (and also to be used if the Germans were initially successful) a huge force of reserves was based in the rear led by Koniev. In charge of all these men was Marshall Zhukov. The Russians had also placed vast numbers of men and equipment in the Kursk bulge. 1.3 million soldiers were based there, 20,000 artillery pieces, 3,600 tanks and 2,400 planes. The Russians had guessed where the Germans would try to use their tanks in depth – and placed a large number of their anti-tank artillery guns there. Trenches and other anti-tank traps were dug. The depth of defences included the laying of 400,000 mines, which equated to 2,400 anti-tank and 2,700 anti-personnel mines every mile – more than at the Battle of Moscow and the Battle of Stalingrad. By June 1943, 300,000 civilians were helping the Russians build defences around the Kursk salient. They repaired 1,800 miles of road and dug thousands of miles of trenches. German prisoners captured by Russian shock troops before the battle actually started, told the Russians that the attack was to be on July 5th. To pre-empt the attack, the Russians launched a massive artillery bombardment at 02.00 on July 5th. This had an impact on the morale of the Germans as it was clear that their plan had been compromised. After the bombardment had finished, it took nearly two hours for the Germans to reorganise themselves. Germany started her attack at 04.30 with an artillery barrage. A tank and infantry attack started at 05.30 once air cover had arrived. The main thrust contained 500 tanks; heavy tanks at the front, supported by medium ones behind with infantry behind these. The Germans tried to break through on four occasions. They gained 6 miles of land in the first 24 hours of fighting but at a cost. 25,000 men had been killed or wounded, 200 tanks and self-propelled guns had been lost and 200 aircraft. A similar pattern occurred over the next few days. Ferocious German attacks were met with ferocious Russian defence. By July 10th, the German IX Army had lost 2/3rds of its tanks. Even the mighty Tiger tanks were falling victim to the Russians anti-tank guns. Russian tank commanders also quickly learned that if they attacked a Tiger side-on, its armour was thinner and more vulnerable. The greatest tank battle of World War Two place on July 12th. In total, 1,500 tanks were involved at Prokhorovka, some 50 miles to the south-east of Kursk. By nightfall, the Germans had not achieved the desired breakthrough. They had lost another 350 tanks and 10,000 men. The strength of the Germans in the south of the Kursk salient had been broken and the Russians launched a major counter-offensive. By July 23rd, the Germans had been pushed back to where they had stated their attack. The initiative now lay with the Russians who had a forward momentum to their advantage. The Germans were literally on the back foot. On July 12th, the Russians launched another counter-offensive in the north of the salient in an effort to relieve Orel. They outnumbered the Germans two to one in all areas. Unable to call in reinforcements from their men fighting in the south, the Germans were unable to hold off the Russian offensive. By July 19th, the Russians had pushed forward 45 miles. The Russian Air Force ensured that the Luftwaffe was incapable of giving the army the support it needed. Faced with the collapse of its forces in Orel, General Model asked Hitler’s permission to withdraw to the Hagen Line. Model warned Hitler that the Wehrmacht faced another Stalingrad if the withdrawal was not allowed. The German Army in and around Orel pulled back 60 miles in an effort to regroup. However, by the time the withdrawal had occurred, German troops were exhausted after constant harassment from the air by the Russian Air Force. By August 5th 1943, Orel was back in the hands of the Russians. The German retreat was severely hindered by partisans who destroyed many miles of rail line which ensured that train engines piled up at rail heads, making them an easy target for the Russian Air Force. A similar situation occurred in the southern sector of the salient. Here the German Army was facing a formidable enemy that had the advantage of being on the offensive. In this sector, the Germans had 300,000 men and about 600 tanks. The Russians had nearly 1 million men in the region, including reserves, and many more tanks. Their counter-offensive in this sector started on August 3rd and two days later Russian forces entered Belgorod. The partisans who operated in this area derailed more than 1,000 train loads of troops in August – a major factor to explain why the Germans could not move their men around with ease. Morale among the German troops who fought in this sector plummeted. On August 13th, the Russians had broken through the outer defences of the city of Kharkov and by August 23rd, the city was liberated. The retaking of the city of Kharkov is seen as the end of the Battle of Kursk. 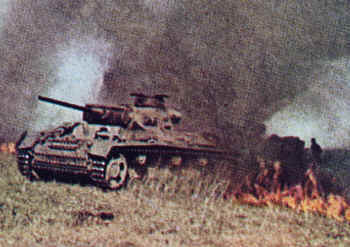 The Battle of Kursk was to have major consequences for the Germans. It was the last major offensive they launched in Russia. Now, their forces only faced retreat and attempting to stop the onslaught of the Red Army. The material damage done to the German Army was massive – 500,000 men were killed, wounded or missing; vast amounts of armour had been lost.